BTV: Essendon Insider - April 2, 2013 We take you behind closed doors as VFL Coach Hayden Skipworth reveals the Essendon 2013 VFL leadership group. 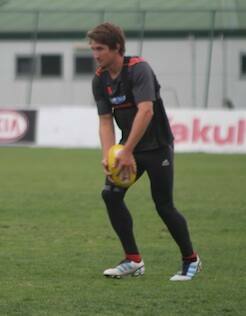 Newly appointed VFL co-captain Ben Duscher prepares to kick at training on Monday. I’m really excited, it was a little bit of a surprise but a real honour to lead this club’s VFL side who I think is going to achieve great things. Essendon Football Club is excited to announce Matthew Bate and Ben Duscher have been appointed co-captains of the club’s VFL side for the 2013 season. Bate and Duscher are part of a four-man leadership group announced this evening, which also includes Matthew Firman and Jacob Thompson. Coach Hayden Skipworth said both players would play important roles in leading the side throughout 2013. “We are really excited to have both Matt and Ben as our captains in our first year as a stand alone VFL side,” Skipworth said. Bate, who has over 100 games AFL experience with Melbourne, said he was excited to be taking on the role. A former captain of Bendigo Gold, Duscher said he was thrilled to be elected to the position by his peers. “It is an honour especially when you get nominated by your playing group so it is definitely a privilege to have the title,” Duscher said. Watch above exclusive vision of coach Hayden Skipworth making the announcement to the playing group ahead of training on Monday afternoon. Essendon will kick off their VFL campaign against Bendigo at Queen Elizabeth Oval on Friday night.